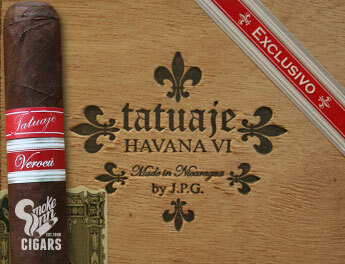 The Tatuaje Verocu was introduced in 2007 as an extension to the Havana VI line. It features a stronger blend and remained limited up until the release of the Verocu No.5 in 2010. Now for 2015 at annual IPCPR Convention & Trade Show, Tatuaje introduced a variety of new sizes to the Verocu line as a regular production release. The Verocu is finished with a Habano seed wrapper from Ecuador, below that is Nicaraguan tobacco in the binder and filler blend.